Bloodcurdling Libel (a Summer Story) By Israel Shamir Whatever Jews do not like is ‘antisemitism’. But if a truly unpleasant accusation is aired, the best defence is to roll your eyes to heaven and proclaim, ‘It is Blood Libel’, as Shimon Peres did when the world condemned the Jenin Massacre. The Bloody Passovers of Dr Toaff By Israel Shamir this Trento crime was not an exception: Toaff discovered many cases of such bloody sacrifices connected with the mutilation of children, outpouring of blood and its baking in Matzo (unleavened bread) spanning five hundred years of European history. 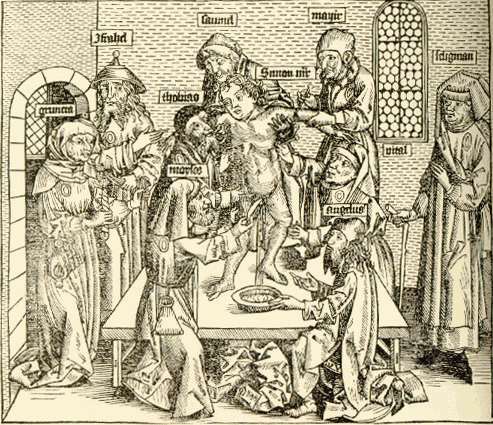 Blood, this magic drink, was a popular medicine of the time, and of any time: Herod tried to keep young bathing in blood of babies, alchemists used blood to turn lead into gold. Jewish wizards meddled in magic and used it as much as anybody. There was a thriving market in such delicacies as blood, powder made of blood and bloody matzo. Jewish vendors sold it accompanied with rabbinic letters of authorization; the highest value was blood of a goy katan, a gentile child, much more usual was blood of circumcision. Such blood sacrifices were "instinctive, visceral, virulent actions and reactions, in which innocent and unknowing children became victims of the love of God and of vengeance," Toaff wrote in the book's preface. "Their blood bathed the altars of a God who, it was believed, needed to be guided, sometimes impatiently pushed to protect and to punish."